Today our fantastic cellists put on a concert for their parents, playing pieces they have learned over the past few months. They all played extremely well in their groups and as soloists too. It was lovely to see and hear their good progress since their last performance and to see them supporting each other in their playing. Well done to you all and to Mrs Mulenga who has encouraged you so positively and taught you all so well since September. Congratulations too as many of you have achieved Music Medals this term- we are very proud of you. Thank you very much to the parents who were able to attend - we really appreciate your support-and to Mrs Mulenga for her hard work. Two weeks ago the whole school gathered to hear the story of The Great Paper Caper where we learnt about the mystery of trees going missing from a forest. It turns out it was the work of a frustrated bear who was desperate to win a paper airplane competition, but wasn't very good at making them! The animals who lived in the wood sent us a letter asking if we could help Bear to find out what the best airplane was, so we got to work straight away. EYFS and Key Stage One investigated different types of material whilst Key Stage Two used their science knowledge to focus on the design. 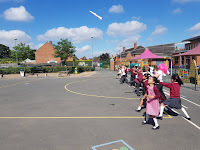 We all used our science skills to plan our investigations and design our planes. 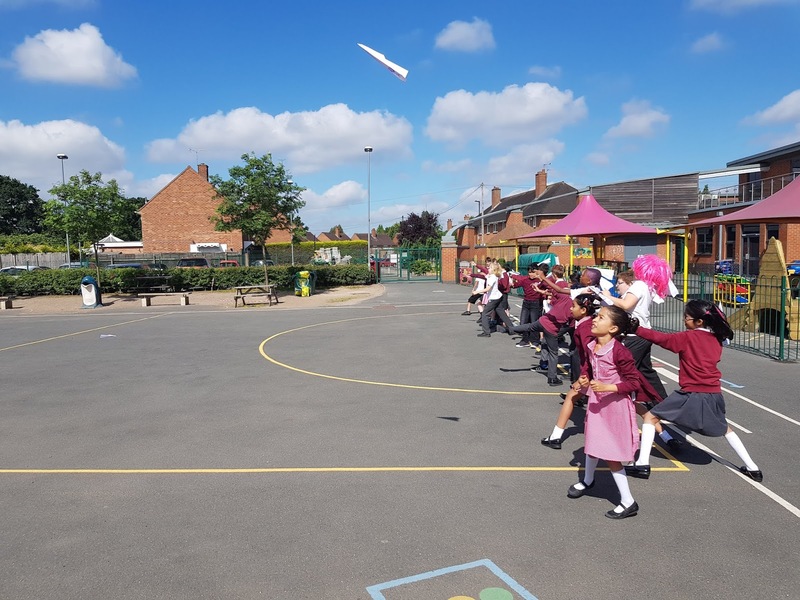 There have been many practice sessions and test runs held on the playground during the last two weeks and we have all reported back to Bear with our findings. We were very good at explaining our scientific knowledge to him. Good luck Bear, we hope you win! Yesterday we enjoyed a lovely concert from our violin and viola players, playing pieces they have learned over the last few months at school. They all played extremely well in their groups/pairs and Anna also played a solo beautifully. It was fantastic to see the progress made by our `beginners` who started in September 2017 and the progression throughout each year group as we listened to our more experienced players. So many children have worked hard and improved so much- well done for all your practice- it has paid off. Each group showed superb teamwork listening to each other and keeping to the same tempo and playing alongside the violin accompaniment provided by Miss Hobbs. Congratulations to all of our children who have taken and passed their `Music medals` and `Grade exams` this year- and to all of you who have taken part in the `Area Ensemble orchestra` and `Junior Strings`, we are very proud of you all . Well done to you all and to Miss Hobbs who has taught you so enthusiastically and supported you so positively in your learning since September. Thank you very much to the parents who were able to attend - we really appreciate your support-and to Miss Hobbs for her hard work this year- we hope that she has enjoyed her year at Chilcote and we look forward to welcoming her back in September. 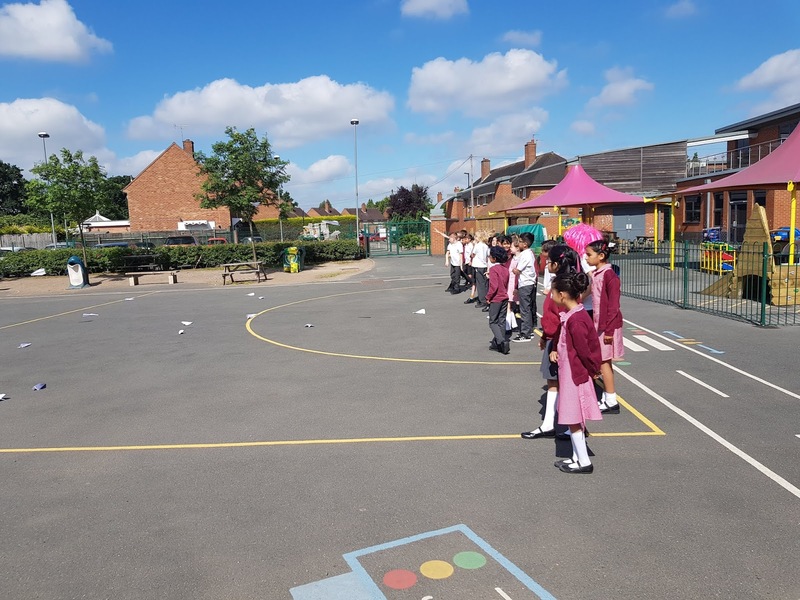 On Friday 22nd June four children from Year 4 and four children from Year 6 represented the school in a mixed tennis tournament at Cannon Hill park. Both Year groups were representing the Kings Heath Partnership at the Birmingham finals courtesy of winning the local partnership event. In both tournaments there were eleven teams split into two groups. Chilcote were in the group of six for both. Each member of the team played against the corresponding player from the other school for a set amount of time. Then their results were put together to make a score. If it was 2v2 after the four games the result of the overall match was determined by who had scored the most points across the four games. 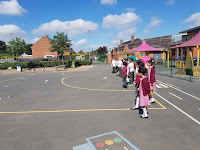 The Year 4 children drew their first game 2v2 and drew on points scored with the school. They then won 3v1, 3v1, 4v0 and 3v1 in their next four matches. Due to the draw they had to replay against the first team and drew 2v2 again but this time the other school scored 2 more points. This meant that the group was tied three ways between Chilcote and two other schools. Fortunately, courtesy of individual wins Chilcote finished in first place in the group and progressed into the final to play against the winners of the other group - Coppice. Unfortunately, this was a step too far and Coppice ran out 4v0 winners. Having said this the Chilcote children finished the day ranked as the second best primary school tennis team in Birmingham - an incredible achievement!!! The Year 6 children began their first game with a 2v2 draw too but unfortunately lost out on points. They then won their next game 3v1 before losing 3v1 in their next one. They lost the next match too, again 3v1 but won the final match of the day 3v1. So all in all they won 2, lost 3 including the draw/loss on points. This meant that they finished fourth in the group and as the 7th best primary school tennis team in Birmingham for Year 6 - a remarkable achievement!!! Well done to all of the children involved in the day. Once again they all did the school proud!!! Labels: Kings Heath School Sports Partnership, P.E, PE, Sports, Tennis, Tournaments, Year 4, Year 6. Katie Jane and Luke- our two most experienced cello and guitar players, performed for Year 1,2 and 3 and their families at our Award assembly on Tuesday 19th June. They both performed solos very confidently and expressively and we enjoyed their playing very much. Thank you both and to Mr Chamberlain who came to accompany Luke. Labels: Cello, Community, Guitar, Music, Year 6. On Wednesday Year 1 had an amazing day in Brueton Park, Solihull. We spent the day exploring the Nature Centre, looking for insects, pond dipping, finding out what it might be like to be a squirrel, doing a maths lesson using sticks and leaves and most exciting of all rescuing froglets from the path near the pond and putting them in a safer place. We all worked really hard and were very hungry when it was lunch time. We pretended that we were squirrels and hid an acorn ready for winter. We found out what it might be like to be a squirrel or a bird looking up at the trees. Our friends had to guide us to keep us safe. We collected leaves and sorted them to find out which colour was most common. Bug hunting. Look what I found! We had a great day and were all really tired when we got back to school. On Wednesday 13th June ten children from Year's 5 and 6 represented the school at a cricket tournament held at Moseley Ashfield ground. In total, four schools entered the tournament: Chilcote, Hall Green, Bells Farm and The Oaks. They each played each other once in a round-robin format and the school with the most points at the end would be the winner. Chilcote started against The Oaks and were put into bat first. They batted well and scored 256 runs. Chilcote then fielded and bowled. They were brilliant and managed to keep The Oaks to a score of 201. So a 55 run win in the first game with ten wickets taken. In their second game Chilcote played against Bells farm, who opted to bat first. They posted a good score of 224 for 3. Again Chilcote bowled and fielded excellently. In reply they managed to score a fantastic 270 runs. In their final game Chilcote played against Hall Green who had also won all of their matches. It was a thrilling and tense encounter with both teams playing some superb cricket. Hall Green set a score of 272 to draw and 273 to win. Chilcote batted well and went into the final two overs needing 12 runs off 12 balls. This then turned into 8 runs off the final 6 balls. Unfortunately in chasing the win they lost a wicket at the end and ended up on 263. A fantastic effort by all of the children! Well done to all of the children for a very respectable second place finish!!! 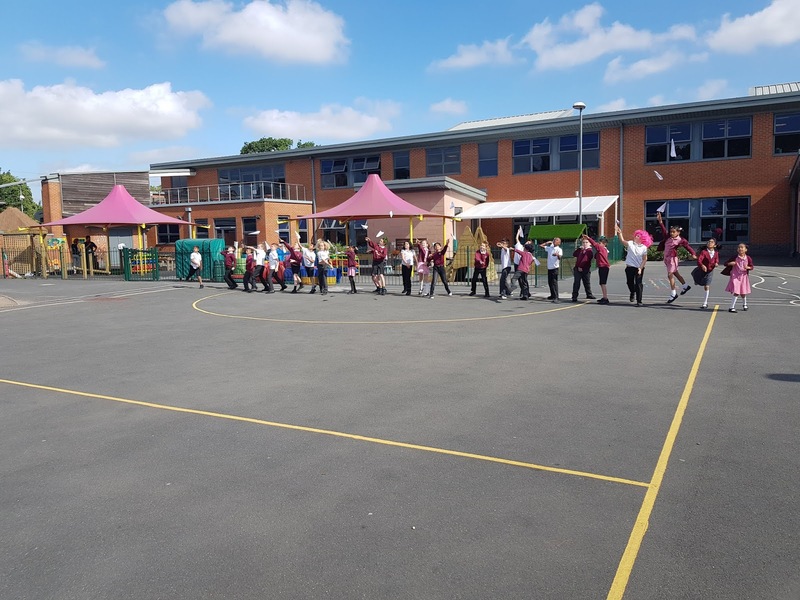 On Tuesday 5th June, Infant choir set off with much excitement to catch the train into town to take part in an interactive singing concert especially designed for Year 2 children. We had initially been told it was at Symphony hall but at the last minute had a change of venue. We enjoyed a picnic in the park surrounding St Phillip`s cathedral and then walked to the town hall. The concert was fantastic and we all joined in enthusiastically with the new songs and games. It was great to learn some new repertoire as well as sing two of our favourites that we had previously learned at school. Mrs Rafter and Mrs Thomas had to go up onto the stage in two of the songs which was great fun! Everyone behaved beautifully and were a credit to the school and we all thoroughly enjoyed our singing experience. Very many thanks to Mrs Ahmad and Mrs Treanor who gave up their time to accompany us and who joined in enthusiastically and many thanks too to Mrs Rafter for all her hard work. We will enjoy sharing our new songs and games with our friends back at school.